Situated in the quiet area of the resort, with just a 10 minute walk to the beach and a bus stop along the road, the Aquamarine offers guests a convenient location together with an attractive, comfortable environment. The Aquamarine Hotel was only opened a few months before we visited and as a result the finish & level of cleanliness was very high. Its a relatively small hotel (100 rooms) and the week we stayed there was a good social atmosphere. There was never a problem getting a sunbed by the pool no matter what time of the morning or afternoon you went down, but this was really due to the mentality of the guests - none of that getting up at 06:00 to reserve a bed for the whole day. The staff were all very pleasant and helpful, Ivan the barman is a very colourful character, popular with all the guests he'll talk for hours on any subject, including his favourite breakfast (cornflakes with beer). The hotel is a short walk from the beach, less than 5 mins. It takes about 10 mins to reach the main strip but this is actually in the hotels favour - a lot of hotels on the strip have a very open plan terrace and pool which could be a haven for thieves, also the strip is very noisy & busy at night so its good to put it behind you when you've had enough. Outside the hotel is the main road on which you can get the bus to Nessebar or Bourgas. The breakfasts at the hotel are of a good standard with plenty of choice, we also lunched a few times and were more than happy, however the one dinner we had in the hotel wasn't great. The prices in the bar are very reasonable compared to other places, a beer is 2 lev, a coctail 2.5 lev and the rooms have a mini bar which costs 3 lev for a beer not too bad at all. In summary a great hotel, in great location, we would recommend it to anyone. Please note our stay was in Sept 04 (which was not in the option selection), not 05. 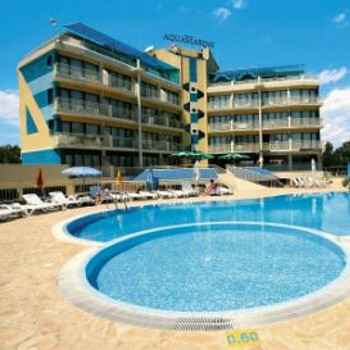 We stayed at this hotel on our first holiday to Bulgaria and despite not being 'resort' sort of people we loved it mainly because the hotel was a haven of peace when we came away from the main beach area. The hotel was brand new (and in places still being finished with the final touches) and it was clean and bright, with nothing shoddy about it. We met the owner and told him 3 stars wasn't enough for the facilities on offer, but he explained he will keep it as 3 as this attracts holidaymakers from Scandinavia etc as they expect more for the rating! The pool was lovely and clean, and maintained on a daily basis. Sun loungers always available. The staff were all lovely without exception - especially Nasko and Elena at the bar. The food was good - different from what we were used to so took a few trial runs to discover what we liked and what we didn't - but quality and quantity no problem. The only downside was having to cross a very busy road to reach the resort, just a short walk away. This was not a real problem for us but I would be cautious about staying here with boisterous children. However, for us it was lovely to come away from the hustle and bustle when we wanted to rest so it suited us. The road noise was not intrusive as the hotel sits back from the street.